The Great Escape Lodge is the first and only (thus far) indoor water park from the Six Flags chain. When it opened, it was also New York's first indoor water park and the first major indoor water park resort in the Northeast U.S. Located across from The Great Escape, the hotel and indoor water park provide additional amenities for guests during the theme park's May-to-October operating season. Open year-round, the resort also provides off-season fun. Six Flags is not known for operating hotels. Its first attempt at a water park resort is quite good. Taking its cue from the Great Wolf Lodge resorts (which in turn hew to classic national park lodges), the property is striking and elegant—in a comfortable, pseudo-rustic kind of way. An inviting, early-1900s Adirondack theme pervades the property. All of the rooms are generously sized suites. They come in various configurations, including some with bunk beds that sleep up to 12 guests. Prices, of course, are very 21st-century and reflect the quality; consider midweek and/or off-season periods for lower rates. At 38,000 square feet, the Great Escape's park is rather small compared to other indoor water parks. Unlike many larger indoor parks, The Great Escape Lodge is lacking a wave pool and doesn't have a water coaster (a natural for a Six Flags park) or other marquee attractions. Also, its single whirlpool spa is rather small and reserved for adults. Despite its size, however, the Six Flags park offers a surprising number of slides and attractions. Attractions include the usual assortment of slides, a (surprisingly long) lazy river, and other water fun. 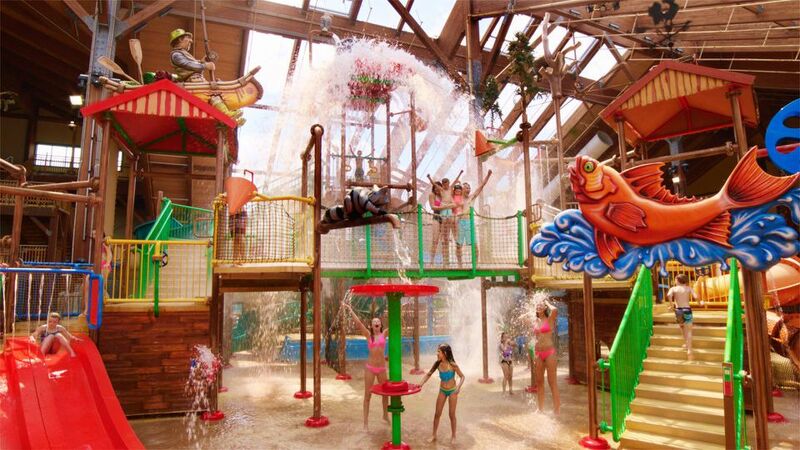 Standouts include the Tall Timbers Treehouse, an interactive water play structure with a tipping bucket, the Avalanche family raft ride, and Boogie Bear Surf, a FlowRider wave simulator for body surfing. The unique roof is made of a transparent material that allows plenty of sunshine and makes year-round tanning possible. The resort offers contests, crafts projects, and a full daily complement of other “dry” activities through its Kids' Club. Think of a cruise ship itinerary for youngsters. The Timbertown characters, which includes Spruce the Moose and Oakley the Bear, often participate in the activities. Although The Great Escape and The Great Escape Lodge are owned and operated by Six Flags, the Looney tunes characters that are featured at the chain’s other properties, such as Bugs Bunny and Daffy Duck, are not on site. The Timbertown characters are unique to The Great Escape. The resort offers Adventure Trek: Quest of the Guardians, an interactive game experience that requires an additional fee. Participants get interactive wands and score points by solving mysteries and uncovering clues that are embedded throughout the resort. There is also an arcade with Skee Ball and other redemption games as well as video games and other skill games. Adults can book a massage or other treatments at the resort's spa. Services are available for kids as well. The Great Escape Lodge also offers a fitness center, which is included in the lodging rates. It's possible to get greasy fries and pizza at the Great Escape Lodge, but the resort's decent restaurants, particularly the cozy Tall Tales Tavern, are a step above typical Six Flags fare. Pub-style fare is available for dinner. The eatery also serves breakfast. There is also a Johnny Rockets as well as a Johnny Rockets Sports Lounge on site. The indoor water park is open to registered hotel guests and admission is included in the room rates. Day passes for the general public are also available. Info is available on the Six Flags Great Escape official site. The resort offers birthday party and special event packages. The resort often offers special deals, including packages that combine stays at the Lodge with tickets to The Great Escape theme park. The Great Escape Lodge is located across from The Great Escape theme park in Queensbury (near Lake George), New York. The actual address is 1213 US 9 in Queensbury, NY. From Boston: I-90W (Mass Turnpike) to Exit B3. Take I-90 to I-87N (towards Albany) to Exit 20. Take Route 9S and turn right onto Six Flags Drive. From New York City: I-87N (NYS Thruway) to Exit 24 (towards Albany). Continue on I-87N to Exit 20. Take Route 9S and turn right onto Six Flags Drive.